Need a last-minute gift for Father’s Day? Use custom themed fabric to stitch up a quick basket liner, then fill it to the brim with coordinating goodies to create a personalized present for any dad. First, find a basket – in fact, you might already have an old basket hanging around the house just waiting to be recycled! Next, use one of these easy to follow tutorials to make a new liner for your basket. Choose a fabric that coordinates with the gift or use Dad’s favorite color. 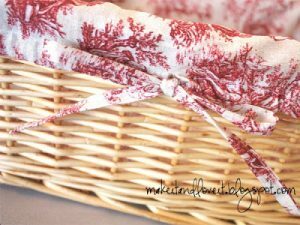 Our Sewing Expert Ashley from Make It and Love It shows you step-by-step how to create a Basket Liner for a square or rectangular basket. Follow along with Delia to learn how she made a custom basket liner in her round Easter basket liner tutorial. Use this tutorial to turn any round basket, bin, or other round container into a custom gift basket! If you are REALLY in a pinch for time, just take the perfectly printed piece of fabric to coordinate with your gift and drape it decoratively in the container, letting some of it pour over the edges so you can see the design. Use green colored fabric or a golf-themed print, and fill to the top with golf balls, tees, gloves, sunscreen, lip balm, hankies, snack mix, a ball marker, divot tool, spike wrench, and a cotton golf towel. 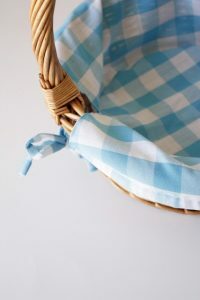 Find some cookery-themed fabric and fill this basket up with some of Dad’s favorite sauces (is he a die-hard BBQ fan, or more of a steak sauce kind of guy), dry-rubs, spices, Dad-sized oven mitts, and a few favorite cooking accessories. Use some fun tool time themed fabric and fill this basket with a pair of vice grips, a small level, assorted carpenter’s pencils, a 6″ stick rule, adjustable channel locks or slip-jaw pliers, a roll of duct tape, a small can of WD-40, and a pair of work gloves or mechanic gloves. It’s kind of fun to come up with a theme and then find things to fill the basket that fit the theme, isn’t it? You could also make a gift basket for an outdoorsman/camper, a fisherman, a dad who loves to read, a home-brewer, or maybe even a dad who crafts. 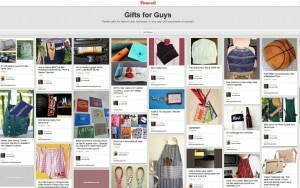 And, if you want even MORE inspiration on DIY gifts for men, check out our WeAllSew Pinterest board, Gifts for Guys!